From the award-winning champion of culinary simplicity who gave us the bestselling How to Cook Everything (Completely Revised 10th Anniversary Edition) and How to Cook Everything Vegetarian comes Food Matters, a plan for responsible eating that's as good for the planet as it is for your weight and your health. We are finally starting to acknowledge the threat carbon emissions pose to our ozone layer, but few people have focused on the extent to which our consumption of meat contributes to global warming. Think about it this way: In terms of energy consumption, serving a typical family-of-four steak dinner is the rough equivalent of driving around in an SUV for three hours while leaving all the lights on at home. Bittman offers a no-nonsense rundown on how government policy, big-business marketing, and global economics influence what we choose to put on the table each evening. He demystifies buzzwords like "organic," "sustainable," and "local," and offers straightforward, budget-conscious advice that will help you make small changes that will shrink your carbon footprint — and your waistline. Flexible, simple, and non-doctrinaire, the plan is based on hard science but gives you plenty of leeway to tailor your food choices to your lifestyle, schedule, and level of commitment. Bittman, a food writer who loves to eat and eats out frequently, lost 35 pounds and saw marked improvement in his blood levels by simply cutting meat and processed foods out of two of his three daily meals. But the simple truth, as he points out, is that as long as you eat more vegetables and whole grains, the result will be better health for you and for the world in which we live. Unlike most things that are virtuous and healthful, Bittman's plan doesn't involve sacrifice. From Spinach and Sweet Potato Salad with Warm Bacon Dressing to Breakfast Bread Pudding, the recipes in Food Matters are flavorful and sophisticated. A month's worth of meal plans shows you how Bittman chooses to eat and offers proof of how satisfying a mindful and responsible diet can be. 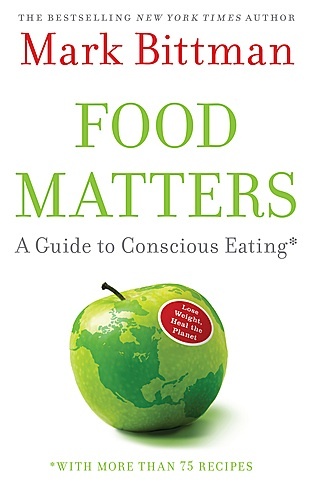 Cheaper, healthier, and socially sound, Food Matters represents the future of American eating. See also The Food Matters Cookbook.